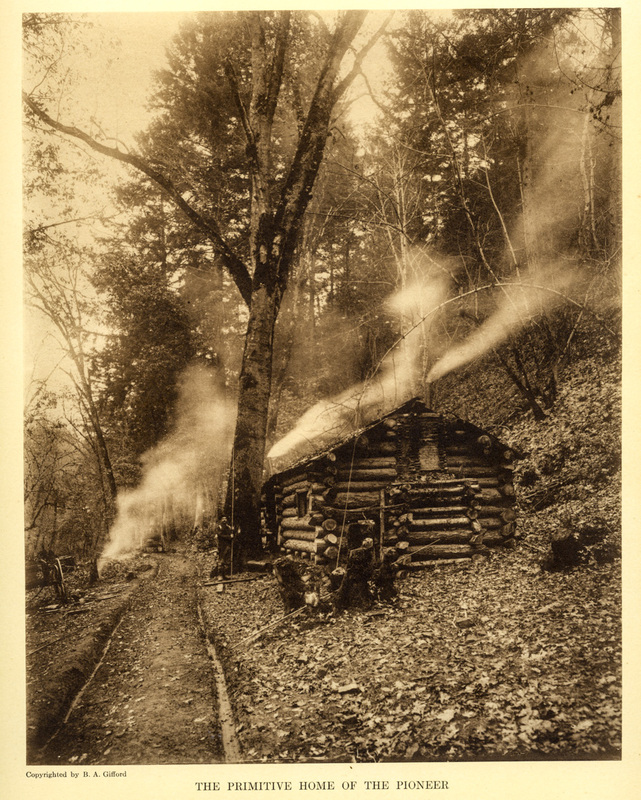 I don't know where this cabin was, but this Benjamin Gifford photogravure has too many great features for me to skip it. There are three different smoky fires. The cabin builder took great pains to level the cabin on the uneven ground shoved up against the hillside. There's a nice wagon on the narrow path, and another one off to the side. And then there's the pioneer, holding a very long very straight stick which almost looks like bamboo. There are several more such sticks in the image. Feel free to speculate! How very interesting. It appears that this settler must have only owned land on the hillside. If he had of owned flat land, unless it was swampy you would have thought he would have built there. There could have been an advantage to building into the hill like this. The cold wind factor. Would not be good for him if that hill behind decided to slide. As mentioned, so much to contemplate. Two chimneys on a longer than usual cabin and no apparent concern about landslides. Looking forward to opinions on the thought provoking poles. Fishing poles? Maybe he built such a large beautiful cabin so he could convince a city slicker woman to marry him and share in the good life. I am going to guess this is right along a river bank. Is there something you could harvest out of trees with those poles? I took a closer look at the poles. They seem to have regular joints like bamboo. I don't see any sign of fishing line or other fishing equipment, but that might be beyond the resolution of the photogravure. Could the poles be for scraping debris off the roof? Looks like there's quite a bit up there. Interesting. Could be a stone fireplace on the near end? Maybe a cooking stove/fire on the other end? Is there a glass in the window opening? Noticed the arched sapling with a small rope down to the stump? Still fascinated with this possible toll house. Bringing in and stacking logs on this hillside would be very difficult and access after completion the same. Seems any family living would require a garden, grazing land or fields, not a steep hillside.